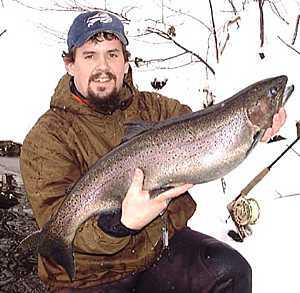 Salmon River Fishing Videos, Pulaski NY fishing videos for Steelhead and Salmon. Welcome to my Salmon River fishing videos YouTube page. 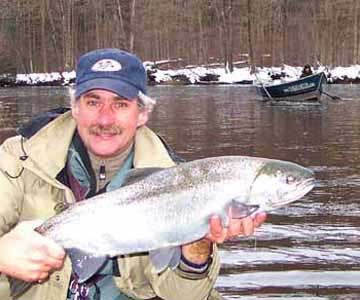 For Expert Steelhead and Advanced Salmon Fishing Videos for the Salmon River in Pulaski NY. 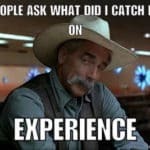 My Salmon River fishing videos goal is to Educate, Entertain and Inspire all fishing anglers of all skill levels. I sincerely hope they get you PUMPED to go fishing and catch MORE Salmon and Steelhead! What helps to cause a BIG RUN of Steelhead or Salmon? Find out where the Steelhead and Salmon hold at in the Middle of the day once they have stopped running the Salmon River, from approx. 9:30 am until 5:30pm? (Skip the repeated Intro. @ 1:11). Money Back Guarantee! Complementary Top Secret (Ssssh!) 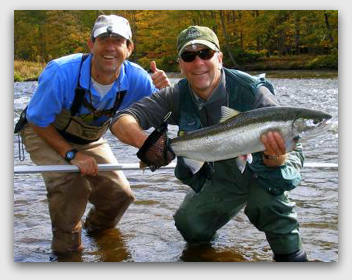 Guide Tips on ADVANCED Fish Locations to help YOU catch more fish on the Salmon River Pulaski NY. Please Subscribe for future Salmon and Steelhead Salmon River fishing videos. Amazing Spring Steelhead Video! (Video Credit “Repeat Client” Allen K). 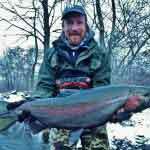 (Steelhead Salmon River fishing videos). 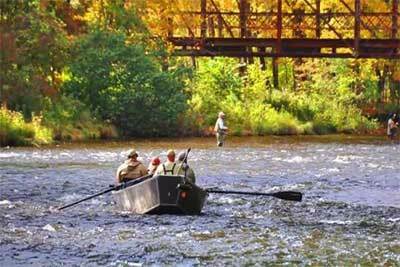 (You Tube Salmon River fishing videos). 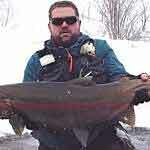 (Pulaski NY Salmon River fishing videos). My You Tube Video Jokes for Today. 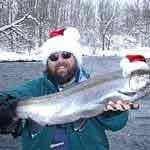 Enjoy my Salmon River fishing videos Humorous Guide Fish Tails for Steelhead and Salmon fishing Pulaski NY. John told me a funny story about his wife and a 15 lb. Steelhead in April on the Salmon River NY. Turns out that as John rushed for the net. He ripped a big hole in his waders and cold water rushed in. When he dove for the Steelhead with the net, he fell in. When he tried to net the Steelhead for the third time he smashed his watch to pieces on a rock. 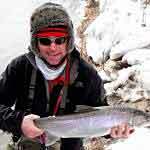 Fish was netted, picture was taken and Steelhead was released. 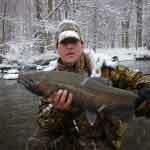 Pulaski NY Fishing Guide Joey K. (R.I.P.) told me a funny story about a Salmon fishing trip. His client was catching his fair share of Salmon, when his client’s glasses went into the drink. They didn’t know at the time a friend of theirs was fishing the hole below them. And caught a Salmon with eye glasses in its mouth. Salmon was released and glasses were kept. The next day he told Joey of his experience. Joey told him his client had lost a pair yesterday. Hence glasses were returned to a very happy Salmon River Salmon angler. Fly Fishing for Steelhead and Coho Salmon on the Salmon River. One memorable day recently was shared with Derick and Sally from Aspen, Colorado. Derrick’s passion is fly fishing the incredible waters that the West has to offer. Mostly trout measured in inch’s. Sally has wet a line on several occasions, but never for Salmon or steelhead. Derick had one of the best acrobatic Steelhead on in a while. It was 100 Yds into that orange stringy stuff (backing). Low in the wires, before it decided to do a little dance for us all. Jumps, somersaults, 15-ft. tail walks, topped the show before giving us an encore performance with some torpedo runs. I don’t think I have ever seen a smile that big! Sally was the only woman in the Salmon River pool when the tip of the rod started pulsating up and down. As if attached to a ball bouncing down the street. Sally yelled, “I think I’ve got one?” All the men in the pool politely reeled up and watched. As I think they all knew this could be one of the better shows of the day. Several of the men in the pool gave out a cheer of encouragement. Sally had an original way of reeling—— out the fish. I guess she wanted to give it a chance? Shortly afterward every guy in the pool was cheering her on and explaining she should reel the other way. Finally at her feet laid a handsome 15 lb. Male Coho Salmon, bright with spawning colors. Jim was very excited to go King Salmon fly fishing today on the Salmon River. He had been out celebrating the night before in anticipation of a great day of Salmon fly fishing. As we walked to the hopeful Salmon River honey hole. He told me he had tied on a brand new fly line late last night. And was interested to see how it performed. It cost him $69. Shortly there after Jim was tight to a fresh run “honka” of a 30 lb. silver Salmon River King Salmon. As the King Salmon ran, he pulled with all his might. The fly rod was almost doubled over. When all of a sudden his backing knot separated from his brand new $69 fly line. “King Salmon attached to fly line” were last seen headed down the Salmon River at a fast rate of speed. I asked Jim what knot he had used to tie his fly line on with. And basically got a blank stare in return. His blood shot eyes and late night partying told me everything I needed to know. At days end I gave Jim a knot tying demonstration. Moral of the story? Wait until you’ve HAD a good day of salmon fishing, before going out to celebrate it. Randy, I just wanted to thank you for one of the greatest Steelhead Fishing days of my life. You are a true master of your craft. 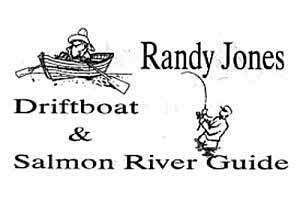 Randy Jones is a Full-Time Professional Drift Boat Spin - Fly fishing Guide with over 35 years of Experience. $275 for 1 angler $350 for 2 anglers Your reservation is confirmed upon receipt of a $100 check deposit (per day) within 7 days of booking to hold your date. Check Payable and Mailed to: Randy Jones 87 Clark Rd. Mexico, NY 13114 No credit cards being excepted at this time.